Can You Tell Me How to Get to the Warsaw Ghetto? 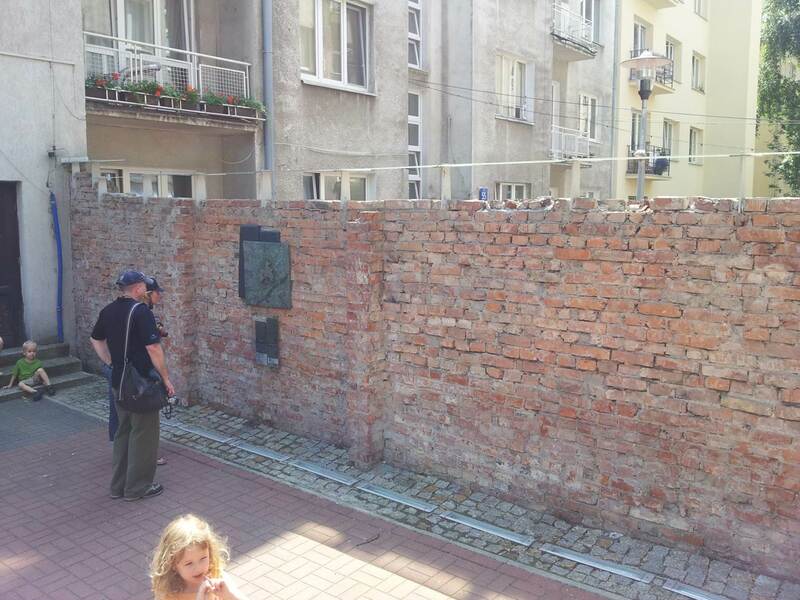 In the courtyard behind the apartment building at 55 Sienna Street, one can still visit a rare fragment of the wall that, for a brief period between November 1940 and October 1941, marked the southern boundary of the Warsaw Ghetto. Though situated just northwest of the Central Train Station, in the heart of the Polish capital’s downtown, it is remarkably hard to find. To approach its east side, you have to be buzzed through a gate by a guard who, though unseen, is apparently keeping watch for visitors, who are invariably checking a map or guidebook against the addresses on the adjacent buildings, certain that if they were in the right place there would be a sign to direct them to a site of such importance. There is not. The momentary puzzlement is interrupted by the rattle of the electric lock and the reflexive desire to push the gate. Against an otherwise unremarkable red brick wall, a dusky plaque shows the contours of the Ghetto and locates this modest section of wall (fig. 1). It turns out that we are still outside the Ghetto. The approach from the western side is more interesting, but more challenging. You have to be lucky enough to find one of the apartment entryways open in order to pass through to the inner courtyard, the perspective from inside the Ghetto. Should you do so, you will also see a space where two bricks have been removed (fig. 2). 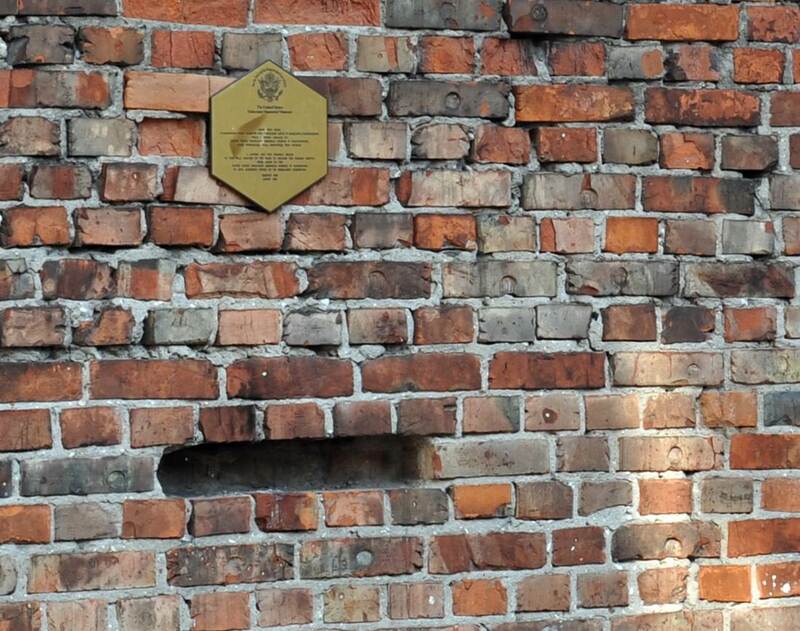 A small hexagonal plaque, dated August 1989, informs the visitor in Polish and English: “A casting and two original bricks of this wall erected by the Nazis to enclose the Warsaw Ghetto were taken to the United States Holocaust Memorial and Museum in Washington to give authentic power to its permanent collection.” An empty space once occupied by the missing bricks stares out from the middle of the wall. Figs. 1–2. One of the last surviving fragments of the wall around the Warsaw Ghetto, east side and west side. Photographs by the author. In this regard, the outline of space around the missing bricks may be more emblematic of the Ghetto as we now experience it than the modest section of wall itself. It suggests an economy of presence and absence, of authentic artifact and simulated space, that is central to the modern experience of the past in population centers, where we witness most readily the conflict between architectural preservation, with its roots in nineteenth-century industrialization, and twenty-first-century urban renewal. Warsaw, this article argues, offers extreme cases of both tendencies through its elaborate recreation of certain architectural artifacts, notably the buildings in and around the historic Old Town, and its near-total erasure of others, especially the former Ghetto. What a visitor looking for the infrastructure of the Ghetto finds instead is an outline of spaces that the willing participant is then called upon to fill in through imagination. As we shall see, the preference for material preservation versus the outline constitutes an editorial redaction, one that has been conditioned by and continues to shape the Polish national narrative. It is therefore oddly fitting that one of the last material traces of the missing city within a city is a wall with missing bricks. As with any material of importance—a historical or religious relic, an energy resource, a precious or industrial mineral—scarcity increases value, which in the case of the Ghetto wall might also be likened to that of an art object. Each of the extant bricks possesses what Walter Benjamin famously termed “aura,” the “authenticity of a thing,” which is grounded in “its presence in time and space, its unique existence at the place where it happens to be.” The brick is the infinitely reproducible construction material par excellence, and in this sense, can be said to lack aura altogether. If a reconstruction of the Ghetto wall were to form part of an exhibit half a century and 4,500 miles from “the place where it happens to be”—as, indeed, it does—what is there to distinguish it from the exposed brick wall of a factory, a restaurant, or a comfortable living room? The two missing bricks from the actual wall are offered here as the vessels of “authentic power.” They exhibit what Maurice Halbwachs once called the “double focus” of collective memory, “a physical object, a material reality such as a statue, a monument, a place in space, and also a symbol, or something of spiritual significance, something shared by the group that adheres to and is superimposed on this physical reality.” To be sure, the bricks that were transported to Washington were not valued merely because they were bricks. At their point of origin, however, the empty space left by those bricks also attains “something of spiritual significance”: it emphasizes the general absence of material, and especially architectural, remnants of one of the most dramatic episodes in Warsaw’s modern history, an absence that stands in sharp contrast to the site-specific memory practices amply displayed on—and in—buildings throughout the city today. The Ghetto’s nonexistence within Warsaw’s contemporary urban landscape has less to do with the practical demands of the city’s postwar reconstruction or with the ideological contours of the historical narrative its planners wished to project than with the Ghetto’s design as an impermanent place, intentionally created so as not to exist. Like the concentration camps that figure more prominently in our historical memory of the violence that Nazi Germany perpetrated against Europe’s Jews, the Warsaw Ghetto was made specifically to exist in one moment and not to exist in the next. Months before the Ghetto Uprising, when Heinrich Himmler gave the order to transfer the “concentration camp” and destroy the Ghetto—notably, the German administration regarded the Ghetto as its own urban space containing a concentration camp—he specified that “the living space which accommodated 500,000 Sub-humans (Üntermenschen), and never was suitable for Germans, will completely disappear.” The man tasked with carrying out this erasure, Jürgen Stroop, a Major General in the SS, punctuated the final destruction of the Ghetto by detonating the Great Synagogue, a non-military target that, at the time of its demise, was located outside the Ghetto. Stroop’s act of architectural destruction differs from outwardly similar displays committed during wartime as an assertion of one’s own ethnic superiority, “performances” that, as Andrew Herscher has observed, “are not manifestations of preexisting and self-sufficient identities as much as solicitations of those identities, conjurings of them, compensations for their otherwise fugitive presence.” The demolition of the Great Synagogue was performative, certainly, as Stroop himself is reported to have told his cellmate while awaiting trial after the war, calling it “[a] fantastic piece of theater.” Yet the message intended by such performative destruction was merely that the destruction that had always been planned had finally been completed. This was not an assertion of superiority or alterity, since here was a triumph over the very need to assert preeminence or otherness. Thus the title of Stroop’s report on the Ghetto’s ultimate obliteration: Es gibt keinen jüdischen Wohnbezirk in Warschau mehr!—The Jewish Quarter of Warsaw Is No More. The fact of this planned non-existence shapes its own peculiar memory practices. Instead of buildings projecting a historical narrative or focusing a collective identity, the empty spaces of the Warsaw Ghetto demand that we fill them with narrative in order to see what is otherwise invisible. In effect, the bricks’ outlines call on the visitor to imagine where bricks once lay. The Polish capital capitulated to the Nazis in the last days of September 1939, less than a month after the invasion that marked the beginning of World War II. From then until January 1945, when Soviet forces drove them from the city, the German administration maintained tight and often brutal control over the entire urban zone and all of its major institutions, with two important exceptions. The first was the Warsaw Ghetto Uprising, a poorly armed rebellion that wrested control of the Ghetto for nearly a month in April and May 1943. The second was the event known as the Warsaw Uprising, which carved out a much larger area of the city barricaded from Nazi control and lasted sixty-three days, from August 1 to October 2, 1944. 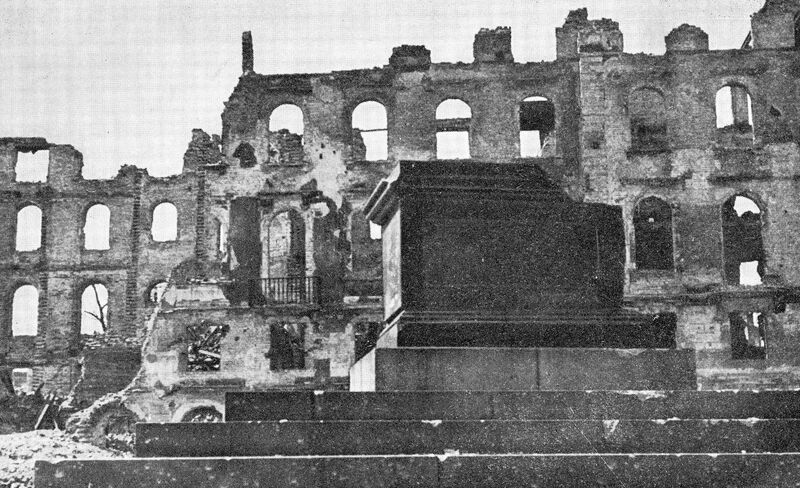 After its suppression, the Germans systematically destroyed most of what remained of the city, leveling more than 80 percent of its architecture before the Soviets’ arrival. Whether we are talking about the territory of the Ghetto or the rest of Warsaw, the story of the city’s postwar reconstruction begins in more or less the same place, and not merely in the sense that both begin from rubble. Unlike most of the Central European capitals vanquished early in the war, Warsaw had been slated for total destruction and reconstruction well in advance, at least as early as June 1939. In this sense, the Nazi effort to level the city following the 1944 Uprising was less a reprisal than the realization of an earlier plan to erect an entirely German city—“German,” that is, as the Nazis understood it—in the space where a Polish city inconveniently stood. From here the stories of the Warsaw Ghetto and the city proper diverge dramatically, and they do so along lines determined by memory practices rooted deeply in the country’s tradition of Romantic nationalism. Having lost their national sovereignty piecemeal between 1772 and 1795, years that saw the formerly powerful Polish-Lithuanian Commonwealth swallowed by Russia, Prussia, and Austria, Poles learned to invest their sense of national belonging in “memory-sites.” Through monuments, plaques, historical buildings, and paintings, Poles could point to a shared cultural patrimoine in the absence of shared political boundaries. There is a clear line of continuity between those practices that maintained a sense of national identity during Poland’s 123 years of partition and occupation, which privileged the use of memory sites as a substitute for the missing state, and the effort to memorialize events and monumentalize historical spaces in the postwar period. Indeed, “modern” memory in Poland is an extension of Romantic memory, the national culture still firmly grounded by its Romantic roots. Thus Maria Janion, one of Poland’s foremost theorists of Romantic culture, sparked considerable public debate when she declared that “the twilight of the paradigm” of Polish Romanticism came to an end only in 1989, that is, with the collapse of Communism. Excellent examples of this practice from the nineteenth century, a century during which Poland was conspicuously missing from the political map of Europe, are the Copernicus Monument in Warsaw and the Adam Mickiewicz Monument in Krakow. Bertel Thorvaldsen’s statue of Copernicus, which was completed in 1830 and sits before the Polish Academy of Sciences, bears the Polish inscription Mikołajowi Kopernikowi—Rodacy—“To Nicolaus Copernicus—from his Countrymen.” Nazi authorities correctly understood the inscription as both an assertion of fact about the astronomer’s ethnicity, which Germans had long disputed, and a point of national pride. Shortly after occupying the city, they replaced the inscription with an identical one, only this time in German, and thus making the same claim for ownership of Copernicus’s legacy. 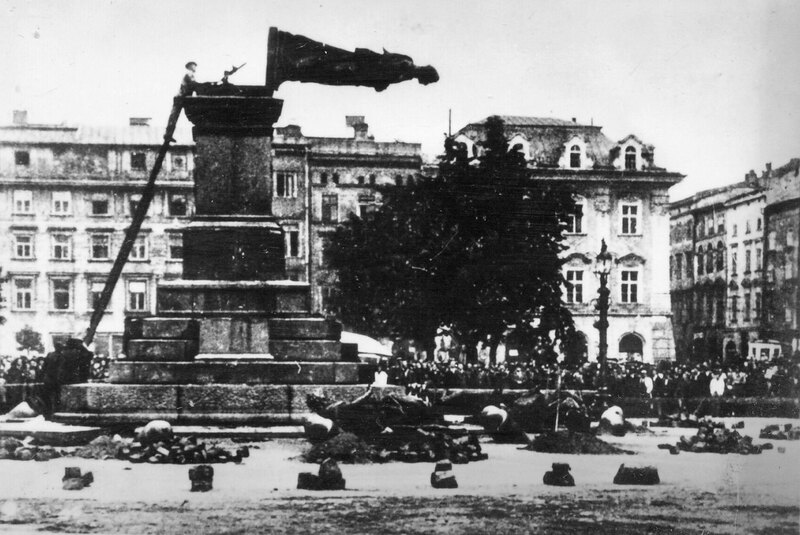 After the suppression of the Warsaw Uprising, the Germans removed the statue altogether (fig. 3); it was only by virtue of the Soviet invasion that it escaped being melted down. Fig. 3. Destruction of the Copernicus Monument in Warsaw. Photograph from Wikimedia Commons. The inscription on the pedestal of the Adam Mickiewicz Monument, designed by Teodor Rygier and completed in 1898, is similar to that on the Copernicus Monument in Warsaw; the only difference is that the dedication is signed Naród, “from the Nation.” Poland’s most prominent Romantic poet had never been to Krakow, and there is a measure of irony in the fact that Pan Tadeusz, his novel-in-verse that serves as the national epic, opens with the words: “O Lithuania! My fatherland!” Yet these inconsistencies are ancillary to the monument’s function as a memory site, a mnemonic anchor for a “Nation” that had been divided between three neighboring states. As with the Copernicus Monument, the significance of the Mickiewicz statue was not lost on the Nazis, who pulled it down in 1940 and shipped it to Germany as scrap (fig. 4). Fig. 4. Destruction of the Adam Mickiewicz Monument in Krakow. Photograph from Wikimedia Commons. Neither of these two acts of architectural destruction is visible in modern-day Poland: both statues were perfectly restored after the war as part of the national program of reconstruction. (Thorvaldsen’s statue of Copernicus in particular has proven itself an effective memory site for Polish communities outside of Poland, notably in Chicago, where a casting was erected in 1973.) Such architectural reconstruction is a key feature of Polish memory practices from the Romantic era to the present, which are intimately bound to physical infrastructure and their identifiable links with the past. Nowhere is this more clearly evident than in Warsaw’s Old Town, just a short walk from the Copernicus Monument. A medieval fortification of red brick surrounds narrow cobblestone streets, centuries-old churches, and quaint, low-ceilinged houses. 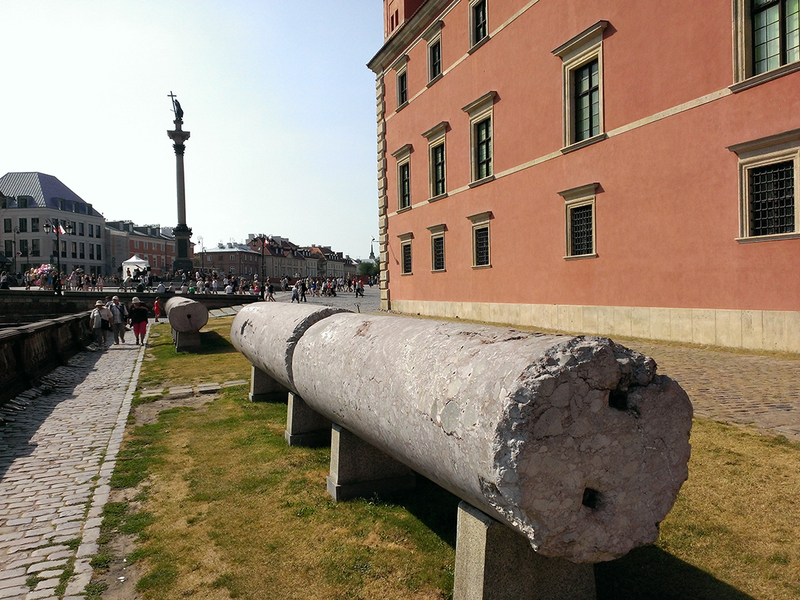 At the Old Town’s southeast corner stands the seventeenth-century Royal Castle, and in front of that the Sigismund Column, itself a monument commemorating the relocation of the Polish capital from Krakow to Warsaw in 1596. What is remarkably odd is that all of this—castle, column, the streets, the houses with their low ceilings and dark wooden interiors—is an elaborate reconstruction. The medieval brick wall surrounding the Old Town, chipped and crumbling at the outset of the war, has been made new—as a chipped, crumbling brick wall. David Crowley has argued that such reconstructions follow a postwar precept to rewrite the history of the city’s defeat as one of triumph, and he borrows Adrian Forty’s term “counter-iconoclasm” to refer to these “things that are remade in order to forget what their absence once signified.” This characterization seems apt in the case of Warsaw outside the Ghetto, though only to the extent that any effort at reconstruction is inherently an assertion of life and creation over death and destruction, whether this serves a socialist progress narrative or not. Much more common than the erasure of historical destruction in Warsaw is the juxtaposition of the ruin and its reconstruction. Even the postwar architectural catalogues that Crowley points to as evidence of erasure, using before-and-after images to glory in the city’s rebirth, rely on the spectacle of ruin for their effect. Similarly, the directors enlisted to capture the city’s rebirth on film were careful to frame shots of new constructions within the rubble around them, leaving a permanent mark on the collective historical memory (fig. 5). Fig. 5. Still from Ulica Brzozowa, directed by Wojciech Jerzy Has (1947; Film Polski). One finds examples of this destruction-within-reconstruction throughout the city. Not only can we tour the impressive halls and galleries of the Royal Castle, painstakingly rebuilt between 1971 and 1988, but we can also visit the ruined fragments of the same castle on display in the Museum of the Warsaw Uprising. Lying on the grass a few paces from the Sigismund Column are the fragments of the Sigismund Column, which the Nazis toppled in 1944 (fig. 6). Quite often, the evidence of destruction is actually integrated into the remade architecture itself, as we see in the fourteenth-century Archcathedral of St. John the Baptist, just north of the Royal Castle. Almost completely destroyed by a “Goliath” remote-controlled demolition tank in 1944, the structure was not only rebuilt—today it looks oddly new for a brick Gothic cathedral—but incorporates the track of the tank that destroyed it as an architectural element (fig. 7). The impression these sites provide is not merely an erasure of the traumatic past, but a more uncanny sense of the coincidence of destruction and reconstruction. Renewal stands next to or projects itself through ruin. We have a conversation with the king’s ghost while standing over his corpse. Even in the case of buildings whose postwar condition allowed them to be salvaged, the restored structure will often preserve its damage as an architectural element. 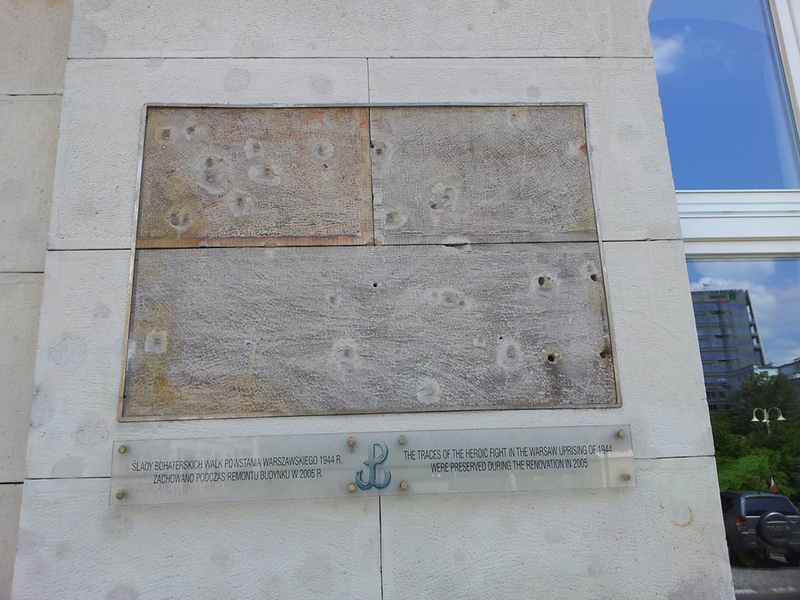 For example, if we move a few blocks southwest from the Old Town to Dąbrowski Square, we see a very solid construction whose façade had been heavily pockmarked by German fire, and while these bullet holes have since been filled in as part of the building’s restoration, they remain visible. More importantly, a section of the façade has been left unrestored and captioned to preserve, as it were, its damage (fig. 8). Fig. 6. Sigismund Column, Warsaw, with its ruins in the foreground. Photograph by the author. Fig. 7. 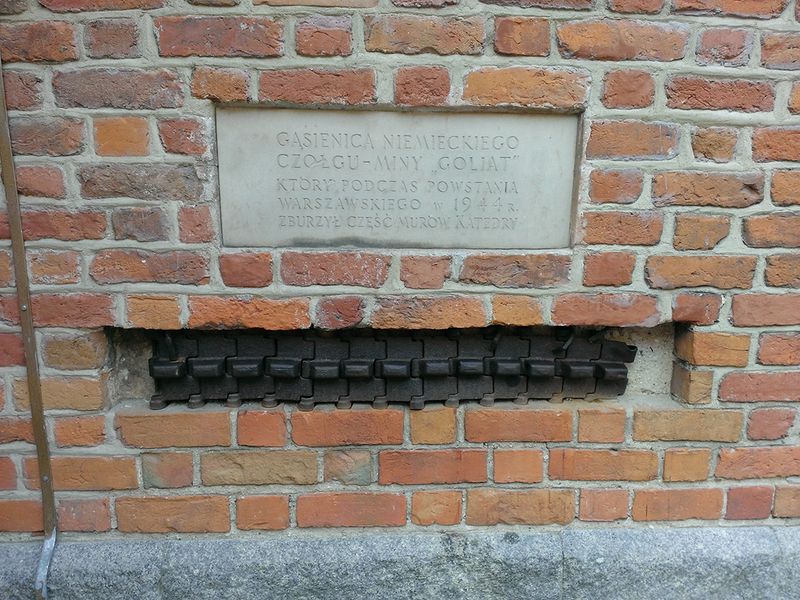 An exterior wall of the Archcathedral of St. John the Baptist, Warsaw, features the track of the demolition tank that destroyed it in 1944. Photograph by the author. Fig. 8. “The traces of the heroic fight in the Warsaw Uprising in 1944 were preserved during the renovation in 2005.” Photograph by the author. The city abounds in comparable opportunities to experience history through architectural monumentalization. Only in exceptional cases is a large structure preserved as a ruin. Much more typically, restored or new buildings bear plaques marking infrastructure below, such as sewer lines used by Polish partisans. Innumerable memorial cornerstones provide detailed information about events and casualties, and these in turn serve as makeshift shrines to the dead, especially when a significant anniversary approaches. Meanwhile, exhortations to remember—that is, to engage actively with this proliferation of monuments—are pasted onto buildings, inviting us with formulas like “Join the game”—referring to an interactive simulation of the Warsaw Uprising—or “Remember to remember” (fig. 9). The paucity of such memory sites in the former Warsaw Ghetto is especially striking when considered in contrast to the density of such sites outside. Whereas the reconstruction of downtown Warsaw has placed visible emphasis on the replica, hardly any of the former Ghetto remains. Even its main streets have been shifted, so that roads now cut through what had once been residential blocks, and buildings fill in what had once been bustling thoroughfares. This profound erasure is not an exigency of Warsaw’s postwar rebuilding. Rather, the Ghetto is a “non-place” by design, a space to be known only by inference and interpolation, by its outline in representation. Fig. 9. 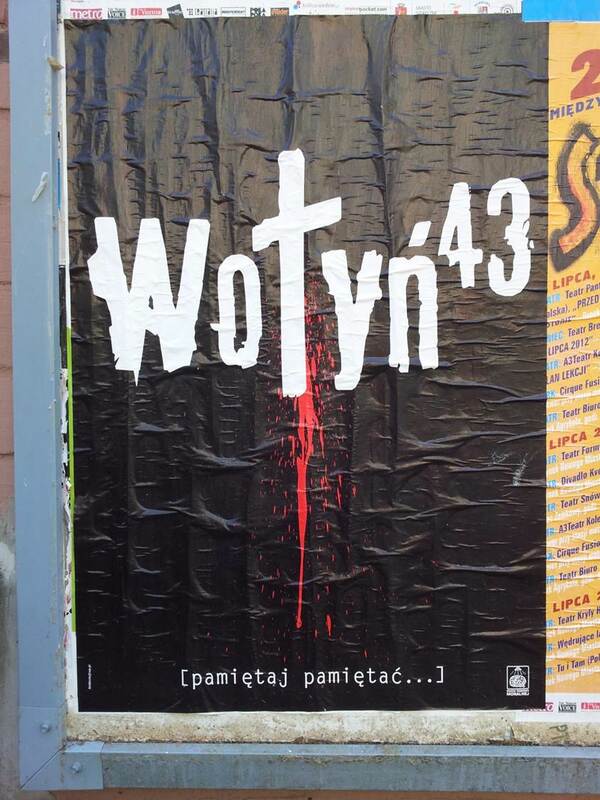 A poster commemorating the Nazi massacre of ethnic Poles in Volhynia in 1943, reminding us to “Remember to remember.” The detail shows this as belonging to “The Campaign for Moral Hygiene.” Warsaw, 2012. Photograph by the author. In speaking of the Warsaw Ghetto, it is important to distinguish it from other historical Jewish ghettos in Central Europe, such as Josefov in Prague or Kazimierz in Krakow. Arising in the Middle Ages and established with specific geographic boundaries, local administration, and legal protections, these minority enclaves were integral parts of their surrounding urban zones, with longstanding, if at times uneasy, relations with the majority population. The historical echo of these ghettos in those used to corral Jews in occupied Europe is largely metaphorical. 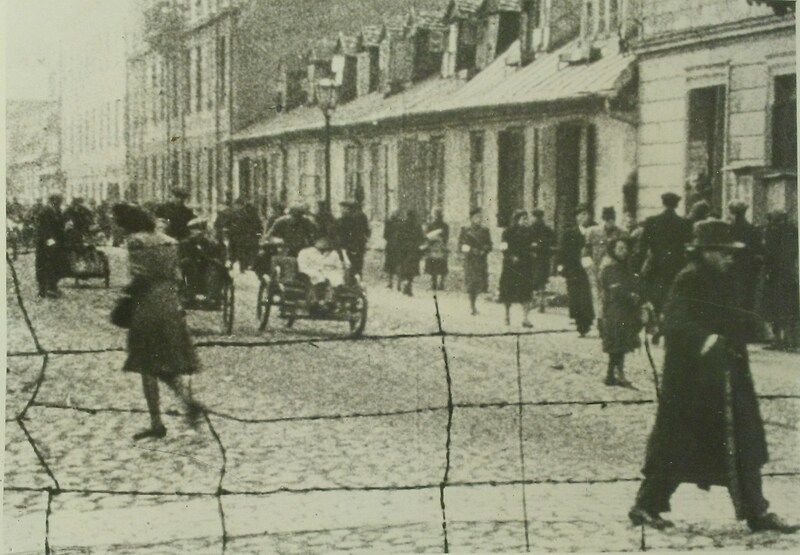 Unlike a historical ghetto, the Warsaw Ghetto was, from well before its inception, created so as not to exist, and during its brief history its borders shifted with changes in its population and German interest in reestablishing access to certain roads and buildings. This evolution is almost uniformly one of progressive diminishment. The Seuchensperrgebiet, or “quarantine zone” established in March 1940 around the Jewish area of the city, with Germans being warned not to enter for fear of disease, was considerably larger than the area walled in and shut off from the rest of the city on November 15. This area was further reduced by several city blocks at a time until the Great Liquidation Action that began on July 22, 1942, during which more than a quarter-million of the Ghetto’s inhabitants were deported to the death camp at Treblinka. In August, large sections of what had been the Ghetto were reincorporated into the “Aryan” city, while an almost equal area within the so-called “residual Ghetto” was formally declared “wild”—vast plots of vacant residential space at the heart of the Ghetto’s overcrowding. The area that the Ghetto had once occupied is now filled with apartment blocks constructed during the 1950s. 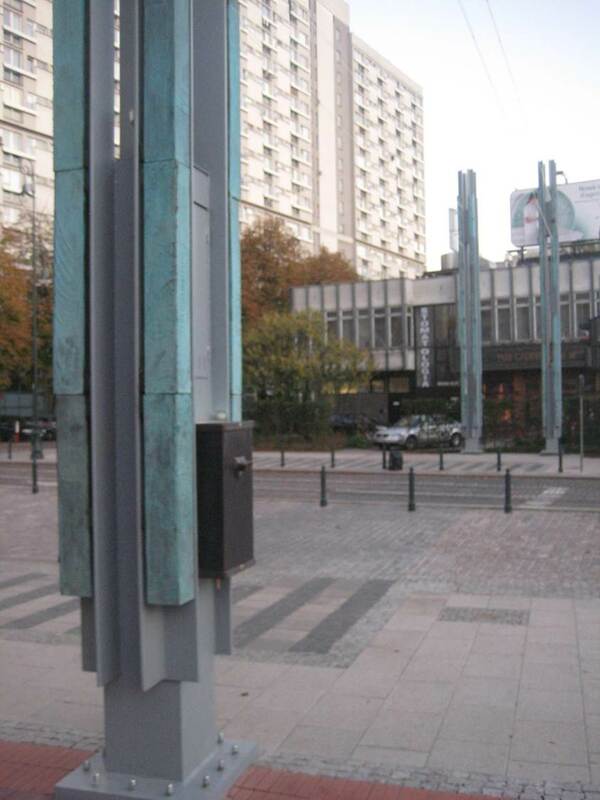 There are, of course, a few memory sites connected with the Ghetto, notably: the controversial Warsaw Ghetto Monument, designed in a Socialist Realist style by Nathan Rapoport and erected in 1948; the stone monument at the northeastern border of the Ghetto that since 1988 has marked Umschlagplatz, where Jews were loaded onto trains bound for Treblinka, 100 to a cattle car; and the enormous POLIN Museum of the History of Polish Jews, which opened its doors in April 2013. These sites, however, are clustered together in an area off the beaten path of the city’s bustling tourist and commercial activity; the Rapoport monument and POLIN Museum face each other on the same block, with the monument to Umschlagplatz two streets away. Furthermore, as Elżbieta Janicka has recently demonstrated, the one city block that has become the focal point for those interested in the Ghetto’s history is itself circumscribed, in a process she terms “symbolic encirclement,” by several monuments that either commemorate non-Jewish heroism with regard to the Ghetto or make no mention of the Ghetto at all. In any event, these sites afford scant opportunity to interact spatially with the former Ghetto itself, and certainly not in any way comparable to the spatial experience of the historic Old Town. Is there, then, such a place as the Warsaw Ghetto? Can we visit it? Materially, what had been the Ghetto is still very much where it had been, insofar as the housing development that replaced it was literally manufactured from its rubble. Materiality, however, can be imbued with significance only by its organization and the practices this organization informs, as the reconstruction of “Aryan” Warsaw—i.e., the city outside of the Ghetto—consistently demonstrates. Since there is no comparable organization of material in the Ghetto, the Ghetto itself has been abolished. Today, it is little more than the vast residential district north of the Central Train Station and west of the Old Town. Though one would likely pass through this space if moving from one place to the other, one is unlikely to be aware of having done so. Instead of a place, the Ghetto is therefore akin to a “non-place,” what Marc Augé defines as “an instrument for measuring the degree of sociality and symbolization of a given space.” The fact that one can so easily pass through the Ghetto without realizing it—that is, move unaware through a space defined by its impassability—suggests how weak the Ghetto’s “sociability and symbolization” actually are. Yet I am modifying Augé’s guarded definition of transient spaces in an essential way. While he insists that neither “place or non-place really exists in the absolute sense of the term”—after all, individuals and communities regularly assign value to spaces that go unnoticed by the stranger or passer-by—his examples too conveniently include airports, train stations, and locations that we similarly “pass through” without necessarily noticing (Augé, Non-Places, viii). Here, I think, there is a crucial flaw. Many, if not all of us, would prefer Gatwick over Heathrow, or Detroit International over O’Hare. That is, we often have a strong sense of the particularity of these places, where those of us working within the global marketplace spend considerable time, and to which we may attach personal significance. Closer to what I believe we actually experience as non-places is the boundary zone between what Peter Sloterdijk calls “spheres.” In modern urban spaces, these boundary zones include sidewalks and alleyways, not so much places as magnitudes of space between places. Typically, they have no address. They may be literally between addresses. What I am suggesting, then, is an inversion of Augé’s concept. The non-place is not a space to which no one ascribes significance; the non-place is rather a significance without a site, a lieu de memoire without a lieu. Such is the Warsaw Ghetto. It exists only as outlines and traces, as volumes of space without content. The visitor to the Old Town can climb on the recreated fortification wall. 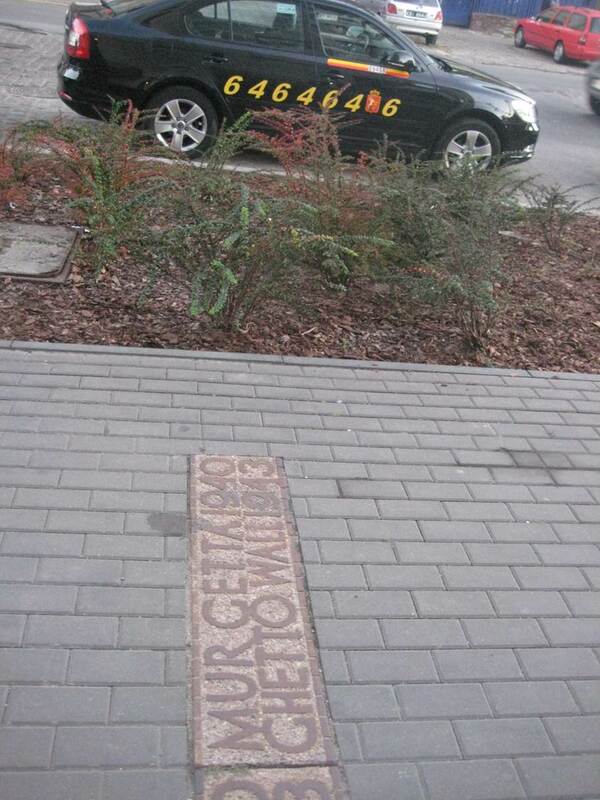 To see the wall that enclosed the Ghetto, one must look not ahead, but down: markers reading “Ghetto Wall 1940–1943” in Polish and English were placed in the pavement at twenty-two locations between 2008 and 2010 (fig. 10). Flush with the sidewalk and indicating lines that cut through present-day streets and buildings, these markers are the opposite of a wall, not only allowing the pedestrian to move easily in and out of the Ghetto territory, but obscuring what “in” and “out” are in the first place. But this effacement was already scripted in the Ghetto’s design. 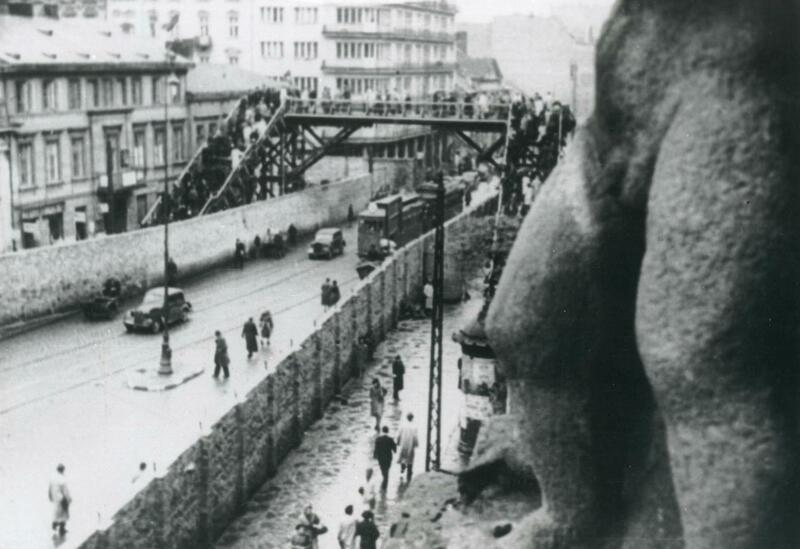 As early as November 1939, just two months into the German occupation, non-Jews were growing accustomed to the disappearance of this urban space, if not necessarily to the disruption it caused in cross-town traffic, as plank-and-barbed-wire barriers were set up to block entry to the “Quarantine Zone.” Photographs taken surreptitiously from the “Aryan” side show the nascent Ghetto as a bustling city unto itself, clearly visible, yet a world away from the rest of the city (fig. 11). This view would be cut off by brick walls by the following June—a reification of what was already a reality, since conceptually the space of the Ghetto had for the most part ceased to exist to the city around it. Fig. 10. Contemporary sidewalk markers showing the path of the wall around the Warsaw Ghetto. Photograph by the author. Fig. 11. Clandestine photograph of the Ghetto before brick walls were erected. Image courtesy of the Jan Karski Papers, Envelope C, Hoover Institution Archives, Stanford University. The Ghetto’s material absence challenges the contemporary visitor with fundamental questions about what it means to visit in the first place, especially insofar as the experience of ghettos, concentration camps, and besieged cities remains so far removed from any anthropological norm of “everyday life.” This unfamiliarity is why so much of the literature of such spaces displays the generic hallmarks of science fiction, with its fetishistic interest in the lexicon, technology, and social structure particular to its storyworld. What kind of information would assist us in “seeing” a city that is no longer there? Are there competing forms of information that have the opposite effect, obscuring our vision of the Ghetto’s particularity and subsuming it instead into a generalized Holocaust narrative? In a macabre echo of speculative fiction, the Ghetto construct constitutes a space where individual bodies within the Ghetto walls were increasingly unseen by each other and where the communal body was invisible to the larger city. Let us consider these two levels separately. Once it was enclosed, a Jew caught outside the Ghetto wall would almost certainly have been shot on sight, a punishment formalized by decree in October 1941. The following month another decree extended the death penalty to anyone on the “Aryan” side who sheltered or helped a Jew. Likewise, non-Jews were restricted from passing into the Ghetto. This did not mean, of course, that there was no mixing of the segregated populations. On the contrary, there was a well-developed system for smuggling food and small arms into the Ghetto through sewer lines or holes specially dug into or under the wall, though this work, reserved largely for children small enough to negotiate the tight spaces, was extremely dangerous. Adjoining the wall on the outside was a large open court that likewise surrounded nearly the entire ghetto. One of the buildings on this court was so constructed that its front door opened into the Aryan district, while an exit from its cellar led directly into the ghetto. This building gave many Jews the opportunity of contact with the outer world. With bribery, circumspection, a willingness to take the risk of being caught, and a thorough knowledge of the confusing cellars, the passage was comparatively easy. Indeed, at that time, the building had become like a modern version of the River Styx, which connected the world of the living with the world of the dead. Very few people within the Ghetto, of course, could boast Karski’s skill and experience at espionage, nor did they have anything of value with which to bribe their way into the “Aryan district.” In this way, Karski’s account of the permeability of the border separating the Ghetto from the city around it merely emphasizes the Ghetto’s spatial alterity, the sense that it exists as a world unto itself. What is most striking about Karski’s description is how he, too, experienced the Ghetto as a world apart, a dimension both within and outside our own: “To pass that wall was to enter into a new world utterly unlike anything that had ever been imagined. The entire population of the ghetto seemed to be living in the street. There was hardly a square yard of empty space” (Story of a Secret State, 311). I am jotting down all these experiences together with my own pain and tears of powerlessness, but I have the impression that it is only today that all of this reached me so immediately, so inexorably, that the whole truth of our defeat and lost life looked me in the eye naked and uncanny for the first time. It started after lunch, when a friend of mine arrived who had spent yesterday on the other side of the wall. You know, she says to me, I look around the street, people are strolling along without a care, the shop windows are exquisite, life is a colorful ribbon unwinding. Two images juxtaposed in Jan Jagielski’s bilingual catalogue Niezatarte ślady getta warszawskiego/The Remnants of the Warsaw Ghetto (2008) will help us shift our focus from the invisibility of the individual body to that of the communal body. By pairing an archival photograph from within the Ghetto with a contemporary photograph of precisely the same location, Jagielski perhaps inadvertently emphasizes the paradox of his own book’s Polish title: the “ineffaceable traces” (niezatarte ślady, or “remnants” in the English text) have in fact been erased (fig. 12). Today’s visitor to this location, near the corner of Waliców and Pereca Streets, would certainly not find a mostly naked corpse lying on the sidewalk—an unremarkable sight in the Ghetto—nor one of the carts that collected these anonymous bodies every morning for removal to a communal grave. A less conspicuous difference between the images, however, is in their perspectival depth. Although the photographs are taken from the archway of one of the few Ghetto structures to survive to the present, they provide radically different visions of the same view. The wall that enclosed the Ghetto, thereby foreclosing the viewer’s perspective, excluded the street on the other side, allowing only enough clearance for pedestrians or a small cart to move alongside the building. Comparing the two images, we see that it is not just the human body that has been removed. The Ghetto’s body has been “effaced” as well. Fig. 12. Juxtaposition of an undated archival photograph from Żydowski Instytut Historyczny, Warsaw and the same location in 2008. Image 6 from Jan Jagielski, Niezatarte ślady getta warszawskiego/The Remnants of the Warsaw Ghetto, 2nd ed. (Warsaw: Mówią wieki, 2008). Photograph courtesy of Jan Jagielski and the Jewish Historical Institute, Warsaw. Nowhere is the notion of the Ghetto as a world apart from the city brought into more powerful relief than in images of the Chłodna Street footbridge. An important thoroughfare and tram line across downtown Warsaw, Chłodna Street bisected the Ghetto into the Greater Ghetto to the north and the Small Ghetto to the south. Each was home to at least one major German factory (called “shops”) that required Jewish slave labor, yet the tramline was a valuable part of the city’s transportation infrastructure. The solution was to wall off the full length of Chłodna Street along both sides as it passed through the Ghetto and to build a single footbridge connecting the two zones (fig. 13). This way, Jews could commute back and forth over the tramline without any contact with the “Aryan” population below, while Poles and Germans could pass through the heart of the Ghetto without ever having been there. Both populations were required to unsee each other, and this unseeing quickly became prerequisite to the functioning of both the city and the shrinking “city” it contained. Just as the wall that once enclosed the Ghetto is traced by lines implanted in the pavement, the Chłodna Street footbridge immediately confronts us with the contrast between filled memory sites outside the Ghetto and empty outlines within it. In 2007, the city commissioned Polish artist Adam-X (Adam Jastrzębski) to produce a stencil on a concrete slab to mark the site (fig. 14). 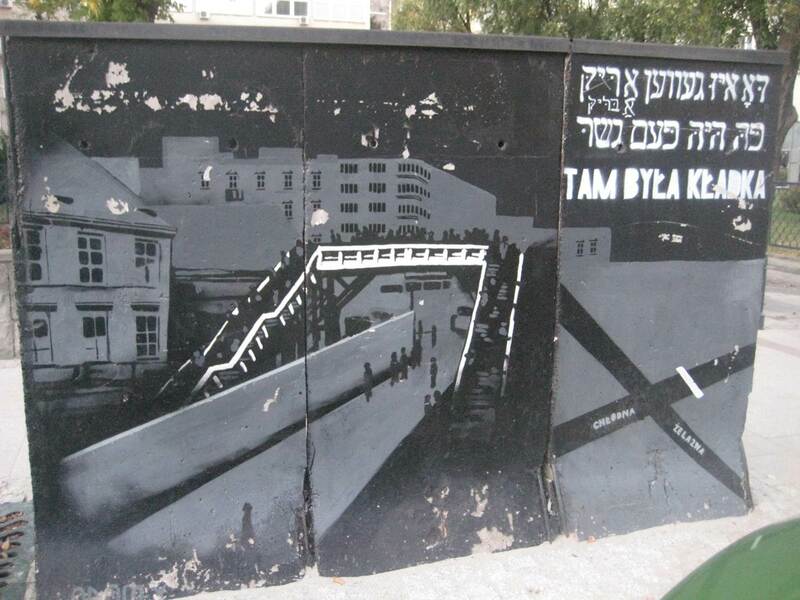 In Yiddish, Hebrew, and Polish, Tam Była Kładka, or “The Staircase was There,” offers no other explanation than its title and the image, which is already purely iconic: it not only stands for an architectural feature of the occupied city, but is more urgently a sign of human abjection leading to spatial abjection—quite literally, as human beings “cast out” from the city’s natural space. In 2009, two young artists, Anna Baumgart and Agnieszka Kurant, placed a temporary installation—Wielokropek, consisting of a large “ellipsis” between parentheses—in the space where the footbridge once crossed (fig. 15). 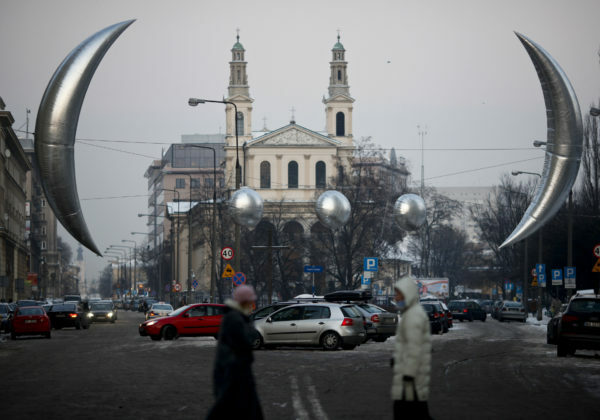 The same space has been marked since 2011 by Tomasz Lec’s permanent installation, entitled Kładka pamięci (“Staircase of Memory”): pillars on either side of the street are connected by steel wires strung over the street to outline the space that the footbridge once occupied (fig. 16). Each pillar contains a small viewfinder that gives interested passersby an audiovisual display of that which is obviously absent—the footbridge itself. Fig. 13. Footbridge over Chłodna Street connecting the two halves of the Ghetto. Undated archival photograph. Photograph courtesy of the Jewish Historical Institute, Warsaw. Fig. 14. Adam-X (Adam Jastrzębski), Tam Była Kładka, stencil on concrete, 2007. Photograph by the author. Fig. 15. Anna Baumgart and Agnieszka Kurant, Wielokropek, 2009. Photograph courtesy of Anna Baumgart and Agnieszka Kurant. Fig. 16. Tomasz Lec, Kładka pamięci, 2011. The dark rectangular boxes in each column provide photographs and sound to evoke the absent staircase. Photograph by the author. Each of these artistic responses emphasizes the Ghetto as a non-place, a “something missing” that can only be outlined, not recreated or experienced. Similarly, in May 2013, a 1:10 scale model of the Great Synagogue, designed by Jan Strumiłło and rendered in particle board, was placed temporarily near the site where the synagogue was destroyed in Stroop’s act of “theater.” It was entitled Wielka Nieobecna (The Great Absent). We may read these artists’ consistent interest in marking the Ghetto’s absence negatively, as a counterweight to Polish memory practices that rely on presence and recreation elsewhere in the city. But there is also a positive reading, one that speaks more robustly not just to the renewed interest in the Jewish legacy that we see throughout much of Central Europe in the post-Communist period, but also to the fact that these artists are all children of postwar Poland. They mark outlines of absence in their installations, since this absence is all they know of the city within the city. In this sense, the post-traumatic situation that the millennial artist addresses with a stencil or an ellipsis is quite separate from the Ghetto’s trauma, and at the same time it is total in its collectivity. Such a circumstance presents a serious challenge to an underlying assumption of Frank Ankersmit’s argument that the Nazis’ crimes created many individual traumas, not a collective one, since “their actions did and could not become part of our collective future.” In downtown Warsaw today, the collective future was scripted in real and enduring ways by Nazi design, at least insofar as the architectural presence of Muranów physically embodies the absence of the Ghetto. Rather than attempt to see the Ghetto, these artworks draw our attention to how thoroughly the Ghetto was and remains unseen. The work of amassing documentary traces of the Ghetto began almost immediately, most notably with the Ghetto Archive created by Oyneg Shabbos (in Polish, Oneg Szabat), a conspiratorial organization headed by Emmanuel Ringelblum. A historian of Jewish culture in Early Modern Europe, Ringelblum organized a cadre of archivists immediately after the outbreak of war to document the lives and treatment of Jews under German occupation. As it became increasingly clear that the Nazis’ aims included not only the abuse of Jewish communities but their total annihilation, Oyneg Shabbos adapted accordingly to emphasize “monographs of cities and towns,” that is, conspectuses that included “the economic life, German and Polish attitudes toward the Jewish populace, community governance [Gmina] and its activities, social aid, [and] the most significant events in the life of the Jewish population” in places already marked for eradication. When the Germans accelerated the pace of liquidating the Ghetto, deporting tens of thousands at a time to Treblinka while simultaneously shrinking the Ghetto’s dimensions, Ringelblum and his colleagues began burying an enormous cache of documents in fireproof boxes and large milk cans. The perhaps ironic consequence of Ringelblum’s determination to preserve textual traces of non-places is that we have more information about the Ghetto than about the lives and fates of many of those who were committed to this preservation. The archive’s principal function was not biographical, but rather to mark out the parameters of life in a place that would simply disappear from the urban landscape. In his Text in the Face of Destruction, Jacek Leociak argues that the impulse among victims of the Nazi genocide “to leave a permanent trace behind,” as one Ghetto writer put it, differs from a generic autobiographical impulse in its encounter with an unprecedented, industrialized effort at mass extermination. A trace, then, is fundamentally a mark left for later recovery. It assumes a future reader who is invested in recovering information, the value of which is measured in loss. Leaving such a trace is an act of defiance against those who saw the loss as having no value at all. Here I hasten to agree with Avishai Margalit and Gabriel Motzkin, who have argued against the notion that the mass murder of European Jews was unique simply because of its scale, suggesting instead that what was truly unprecedented was the “particular fusion of collective humiliation and mass destruction.” An essential aspect of this humiliation was to abolish any right for Jews to author traces of their own annihilation. At the same time, the effort to transform the experience of the Ghetto into text fits neatly within the Jewish historiographic tradition. The trace is specific and often clinical, the province of the archivist who puts it away or the historian who brings it back. It draws its significance from being situated within a signifying matrix alongside other traces—thus the necessary intervention of the specialist. The Ghetto icon is, on the other hand, general and emotionally resonant. It signifies on its own. Its power is immediate and spiritual. But because it can therefore be transplanted to circumstances unrelated to its point of origin, it is perhaps more likely to lead us away from the Ghetto than to lead us there. One of the most powerful such icons of the Warsaw Ghetto is the carousel that stood just outside the Ghetto wall and amused Polish citizens within easy earshot of the bustling, severely overcrowded, and violent zone a few meters away. In fact, the carousel on Krasiński Square, off the Ghetto’s northeast corner and in the “large open court” that Karski describes as surrounding the Ghetto, was a temporary amusement, rarely in working order. But it was the centerpiece of a small fair that the Germans erected for the Easter celebrations in late April 1943, in the early days of the Ghetto Uprising just over the wall. The situation of the carousel and swinging gondolas in such close proximity to the Ghetto, by then largely engulfed in flames and smoke, was, if not a direct insult to the fighters inside, then at least an ostentatious display of “unseeing” them. It has become emblematic of the indifferent gaze, and in this sense, a kind of sister-image to the Chłodna Street footbridge. Miłosz’s image conveys its violence through violent juxtapositions: “olives and lemons” against “flames”; the burning Giordano Bruno against “the mob”; Rome’s Campo dei Fiori, traditionally a market square, against Warsaw’s (unnamed) Krasiński Square; and ultimately the “dark kites” of ashes against the hair of laughing couples. So striking is the impression left by these contrasts that some, most notably the literary historian Ryszard Matuszewski, have supposed that the entire scene is an allegorical representation of trauma rather than a historically accurate account. The thing about poetry, especially poetry on a grand scale, is that its images and generalizations carry more weight than historical reality that has not been modified artistically. We know that no meticulous historian’s pen has managed to outweigh the terror-evoking portrait of Richard III, king of England, put down by Shakespeare. Though according to the historians Richard III was not at all the same monster as Shakespeare’s embodiment of him. Something similar must occur, too, with the image of the carousel at the Ghetto wall immortalized by Miłosz’s pen, though my purpose in jotting these words is an attempt, obviously condemned in advance to the fate of all so-called historical points-of-fact, to confront the vision of the Warsaw carousel on Krasiński Square with its actual image as remembered by myself and others. While Matuszewski has some cause for skepticism—the carousel, set up by the Nazi administration sometime in 1942, was a paltry mechanism generally regarded as a cynical gesture by the surrounding neighborhood, and the few extant photographs of the carousel show a mostly desolate square—there is substantial testimonial evidence that in April 1943, on Palm Sunday, the scene was very much as Miłosz describes it. Just as significant as the factual basis of Miłosz’s image is how frequently secondary sources use the poem as their primary source regarding the carousel’s existence, a strong indication of the text’s iconicity. Even individuals who could describe the scene from their own firsthand recollections are just as likely to defer to Miłosz’s depiction, as Janina Prot, a Jewish teenager then living in the city as an “Aryan,” would later testify: “It was music and the people are going on the carousel and it was beautiful weather and it was the wall of [the] Ghetto, and shooting and smoke and screaming, and here people were playing. It was described in [the] Miłosz poem and it was this way as he described.” Adina Blady Szwajger, also living incognito on the “Aryan” side, recalls that, “much later, when I read this poem, I thought to myself that maybe near this merry-go-round he had seen a smiling girl with marsh marigolds,” i.e., Szwajger herself. The documentary treatment of Miłosz’s poem exposes two essential oddities about how the historical reality of the Warsaw Ghetto—that is, the fact of its having existed as an architectural space already predetermined to disappear with its population—relates to text. The first oddity concerns the preservation of the experience of the Ghetto space in textual, rather than architectural, remnants. The second oddity, which follows from the first, concerns how, unlike architectural remnants, text lends itself to potentially infinite reproduction, manipulation, and eventually adaptation to circumstances quite distant in space and time from Warsaw 1943. Most texts will remain in archives and libraries as traces. A few, such as Miłosz’s poem and its particular way of framing the carousel, will be reproduced, manipulated, and adapted as icons. Now that the anthology’s authors have long since been revealed—in addition to Miłosz and Sarnecki, they included Mieczysław Jastrun, Michał Maksymilian Borwicz, and Jan Kott—we can note that none of them was ever inside the Warsaw Ghetto. (Miłosz and Sarnecki were not Jews at all.) What is curious about Apenszlak’s identification of the poets with Ghetto martyrs, however, is that it is not based on some misleading claim within the poems. Instead, Apenszlak notes “the immediacy, the often startling freshness of the images,” as indicative of firsthand experience. In other words, the poems leave so powerful an impression of reality on the reader that the reader naturally assumes that they convey reality. Thus two readers of Miłosz’s poem on opposite sides of the world and in starkly different relation to the historical moment—Jacob Apenszlak in New York in 1945 and Ryszard Matuszewski in Warsaw in 2003—are both mistaken about the poet’s relation to the reality he represents, and yet they both come to the same conclusion, namely, that it is ultimately the artistic devices peculiar to the text that, more than any data or detail, convey the reality of which the text becomes an icon. Miłosz, too, as a non-Jew who thematizes his own non-Jewishness in other poems about the destruction of the Ghetto, grounds the action of “Campo dei Fiori” in its inexorable echo of an injustice distant in space and time—the burning of Giordano Bruno. Fig. 17. Still from Pokolenie, directed by Andrzej Wajda (1955; Zespół Filmowy “Kadr”). Wajda carefully frames a shot showing the carousel with the burning Ghetto in the background. The bitter irony is that it was the Nazis who effectively authored both the textual economy within which Ghetto traces and icons would circulate, as well as major examples of each. The most notable of these texts specifically connected to the Warsaw Ghetto are the Stroop Report and the sixty-minute propaganda film Ghetto (1942), only recently rediscovered. Others include the infamous propaganda film made in the Theriesenstadt Ghetto and the whole of Josefov, the small Jewish Quarter of Prague’s Old Town, which was to have been the site of the Nazis’ planned Jewish Central Museum (Jüdisches Zentralmuseum). Though intended to show the comforts and security of ghetto existence while also paradoxically highlighting Jews’ putative callousness toward the destitute and starving with staged sequences, the two propaganda films provide some of our only film footage of life within these spaces. And the major architectural sites in Josefov do, in fact, now comprise the Jewish Museum in Prague (Židovské muzeum v Praze), part of its attraction being common references to the basis for its preservation, its having been set aside as a “Museum of an Extinct Race.” This macabre phrasing is itself an example of verbal iconicity: frequently repeated, it appears in no Nazi-era record and gains widespread currency only in the mid-1980s and in English, during a high point of American interest in atrocities in Eastern Europe. The Stroop Report, meanwhile, is the source of what may be the single most iconic image of the Ghetto’s destruction (fig. 18). A small crowd consisting mostly of women and children are being forced at gunpoint from a building, their arms raised in surrender. 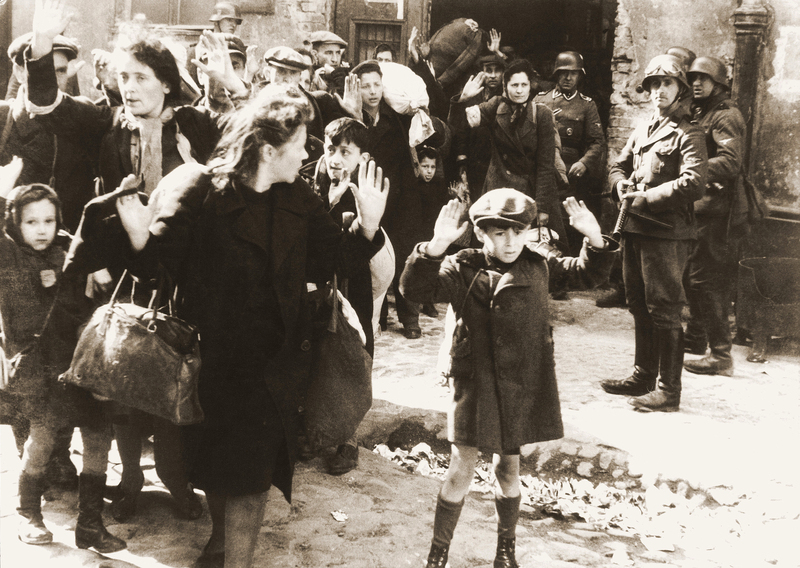 In the foreground, a young boy, perhaps seven years old, is standing at the front of the line, fear clearly legible on his face. A few paces behind him stands a German officer, his machine gun pointed casually at the terrified boy. The handwritten caption in the report describes the photograph simply as “Pulled from the bunkers by force,” a vague designation also applied verbatim to another, apparently unrelated image in the same photographic appendix. The specific circumstances shown in the photograph, as well as the identities of those pictured, remain obscure. Only the German officer with the machine gun has been positively identified—by himself, at trial, before he was hanged for war crimes. Fig.18. “The boy with the raised hands.” Image from the Stroop Report. Commenting on this photograph, Susan Sontag emphasizes its capacity for strengthening our connection with a reality to which we have no other access: “Certain photographs—emblems of suffering, such as the snapshot of the little boy in the Warsaw Ghetto in 1943, his hands raised, being herded to the transport to the death camp—can be used like memento mori, as objects of contemplation to deepen one’s sense of reality; as secular icons, if you will.” In this case, anonymity serves iconicity. Just as Miłosz’s poem exploits lyrical devices to augment its impression of a historical moment, the photograph is perfectly proportioned to deliver its narrative, with the boy as both the compositional and dramatic focus. Around him, we also see a little girl, adult women, and some older men, and we might identify with any one of them, which is why, as Frédéric Rousseau observes in his monograph on the image and its afterlife, this “icon of genocide” has been employed so frequently on the cover of textbooks that introduce the Shoah to schoolchildren—though Rousseau goes on to note that the more frequently such an image appears in connection with its theme, the more likely later authors and editors will use the same image for the same purpose. Such repetition—repetition that generates repetition—is further evidence of the image’s iconicity. Yet it also supports Sontag’s premise while rejecting her conclusion, since the very same connection we feel with the photograph also weakens the photograph’s connection to its specific time and place. The fact that any of us can identify with it belies the fact that none of us was there, or that we cannot even say “who” was there, or where “there” was. “Unmistakably, reproduction as offered by picture magazines and newsreels differs from the image seen by the naked eye,” Benjamin remarks. “Uniqueness and permanence are as closely linked in the latter as are transitoriness and reproducibility in the former” (Benjamin, “The Work of Art,” 223). As we become fixated on what the boy represents, we are drawn away from who, what, or when the boy was. The photograph might then be modified, so better to serve its iconic function, whether by adding a Star of David to the boy’s coat or cropping out figures who might distract us from his terror. The artist Samuel Bak has created an extensive series of paintings that transpose the boy or his outline into fanciful contexts: a brick wall, a sculpture garden, an island. Or else the image might be paired with another iconic text, such as Miłosz’s “Campo dei Fiori,” as it was for a French television special marking the fiftieth anniversary of the Ghetto Uprising in 1993. Of what, then, can the iconic text be iconic, if not of the specific instance it refers to? As these examples clearly demonstrate, the image of the boy from the Stroop Report has come to represent both the absurdity and cruelty of the Nazis’ treatment of their victims within the Ghetto, especially of the helpless and innocent. Miłosz’s “Campo dei Fiori,” meanwhile, has become an emblem for the outrage expressed in the poem’s closing stanza, as Lawrence Weschler illustrates beautifully in his recent book Uncanny Valley: Adventures in the Narrative. Sitting in quiet contemplation at Peter Eisenman’s Memorial to the Murdered Jews of Europe in Berlin just as school lets out for the day, Weschler watches as the serene space is overrun with rambunctious kids, indifferent to the solemnity Weschler ascribes to the site. He immediately thinks of Miłosz’s poem, describing his “building rage barely suppressed” as “the Campo dei Fiori cubed.” Which is to say that Weschler wasn’t thinking of Warsaw 1943 at all. He was thinking of the poem. Whether we find in it an expression of our own tragic bewilderment or outrage, the iconic text positions us once again as outsiders looking in, as viewers seeking communion with the reality on the other side of the icon’s screen, yet incapable of penetrating it. The Ghetto icon is therefore merely a more enduring outline of Ghetto space, not an incorporation of that space into living memory, and certainly not an architectural experience. Looking at an image of the Ghetto, all we know is what it is like to look at an image of the Ghetto. For this reason Miłosz later came to question the ethics of his own poem, since it seems to offer a false communion with an experience that is actually just that of a man looking out the window of a tramcar. The practice of absorbing the Warsaw Ghetto into a broader narrative of historical loss through such infinitely reproducible icons as Miłosz’s poem or the image of the boy with the raised hands is entirely in keeping with modern memory practices, since, as Walter Benjamin so persuasively argued, the modern artifact is the reproduction. To see the Ghetto from within, however, would require a new reliance on the documentary trace, effectively learning how to read in order to learn how to see. So long as the popular icons of the Ghetto constitute the extent of our contact with this lost city, the closest we will get to it will be its outline in space. When, as Europe was still in the thick of its postwar reconstruction, André Malraux first articulated his notion of an emergent musée imaginaire, or “Museum without Walls,” he could not have envisioned a space like Warsaw’s enormous POLIN Museum of the History of Polish Jews. Malraux had in mind not a physical space, but the mental archive of images that each of us builds for ourselves as we attain an ever-deeper familiarity with art across and through various media. The POLIN Museum is an analogous collation of data as it pertains to the history of Jews in Poland, albeit with the added peculiarity that this imaginal archive is embodied in an impressive architectural site. For what the visitor to this building must eventually grapple with is how little it resembles a traditional museum at all. Despite its approximately 43,000 square feet of exhibition space, the POLIN Museum contains almost no original artifacts. Instead, the museum offers a walking tour through informational and interactive exhibits covering a millennium of Jewish history in Poland. A typical visit constitutes an hours-long, if highly condensed, movement across eras and the activities that emblematize them. Visitors literally scroll through Biblical kings while turning a printed ribbon resembling a Torah, learn about Jewish printing while operating simplified presses, and enjoy a glimpse of Talmudic education by reading digital text from screens built into wooden lecterns. A traditional museum privileges the authenticity of the objects over the narrative a specific arrangement might convey; even a historical museum, such as the United States Holocaust Memorial Museum, relies on such “authentic power” enough to remove some of the few remaining bricks that once sealed the Ghetto and the fate of its inhabitants. Lacking even these material markers of authenticity, the POLIN Museum’s Core Exhibition is sequential and unidirectional, lest its simulative narration be disrupted. 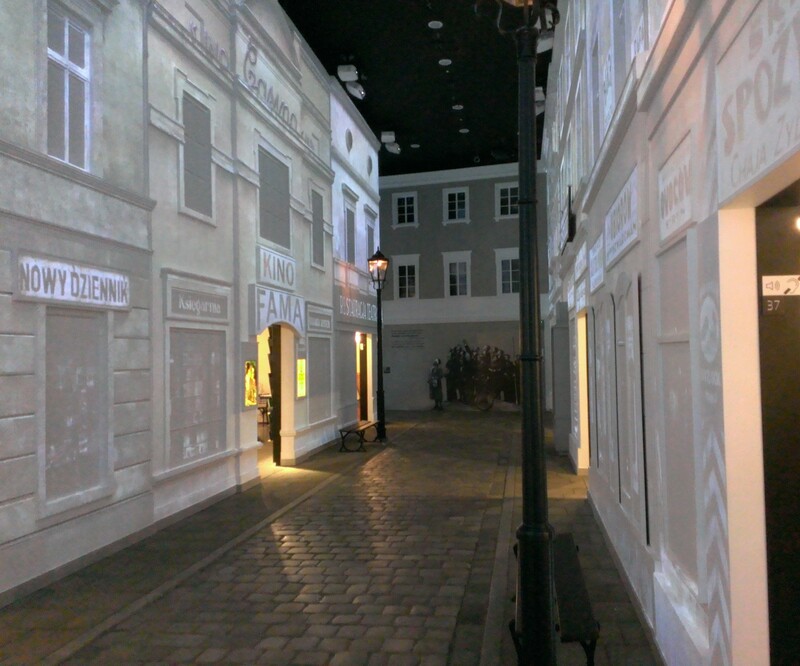 Since we cannot stroll down the nonexistent street of “the City in the City, the City that no longer is,” the museum provides an interwar Jewish street in miniature, complete with cobblestones, lampposts, benches, and the spectral facades of businesses projected onto otherwise blank white walls (fig. 19). 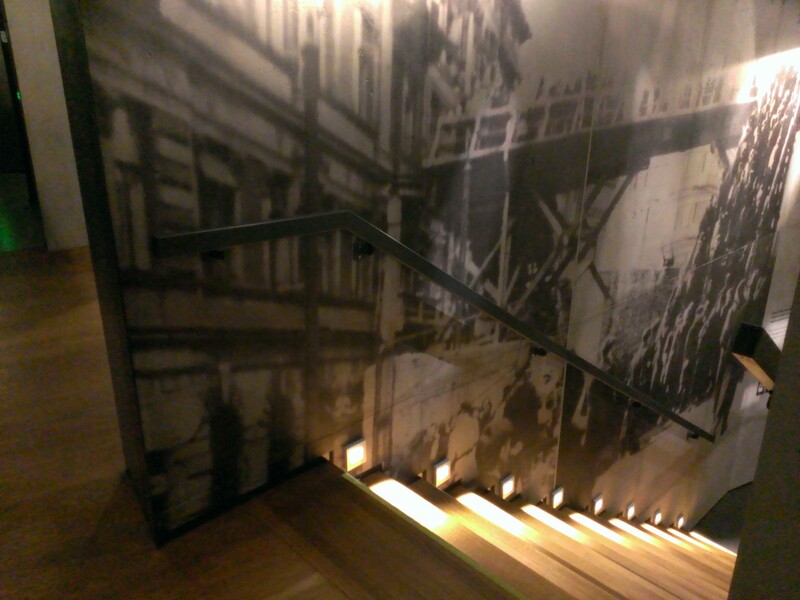 There being no footbridge over Chłodna Street connecting the parts of the Ghetto today, one walks up a wooden staircase bounded by an enormous photograph of the footbridge (fig. 20). Moving through these galleries according to one’s interests and whims, as one might in most any other museum, would destroy the simulation—that is, the very thing that the museum offers in lieu of original artifacts. Today, the Ghetto consists, if it consists of anything at all, of its accretion of documentary particulars, data points that provide our only access to what had once been points in actual space. Fig. 19. A Jewish street in interwar Poland, POLIN Museum, Warsaw. Photograph by the author. Fig. 20. The “staircase” of the Chłodna Street footbridge, POLIN Museum, Warsaw. Photograph by the author. For all its potential virtues as an educational site, the POLIN Museum may also therefore exemplify the memory practices required if we are to visit the Warsaw Ghetto, the “Extinct City” whose space the museum has partially inherited. For a “Museum without Walls” may be ideally suited to representing an urban zone now available to us only in outline, image, and narrative. In a landscape with so little left to see, it is the mental archive that erects a wall that won’t allow the visitor to leave. Stanisław Śreniowski, “Z księgi obłędu i ohydu,” ed. Jacek Leociak, Zagłada Żydów: Studia i materiały 1 (2005): 246–50. This and subsequent translations from Polish are my own unless otherwise noted. Comparing the Ghetto’s urban density to that of individual urban districts today, as opposed to cities as a whole, will yield different results, but such a comparison negates a fundamental fact of life in the Ghetto: its inhabitants were not permitted to leave. Barbara Engelking and Jacek Leociak, The Warsaw Ghetto: A Guide to the Perished City, trans. Emma Harris (New Haven, CT: Yale University Press, 2009), 810. Walter Benjamin, “The Work of Art in the Age of Mechanical Reproduction,” in Illuminations: Essays and Reflections, trans. Harry Zohn, ed. Hannah Arendt (New York: Schocken, 1968), 217–52, 220–21. Maurice Halbwachs, On Collective Memory, trans. and ed. Lewis A. Coser (Chicago: University of Chicago Press, 1992), 204. Secret order from Heinrich Himmler to Friedrich Krueger, February 16, 1943, official translation of document NO-2494, submitted in evidence in USA v. Oswald Pohl, et al., Nuremberg Military Tribunal 4, November 3, 1947, in Trials of War Criminals Before the Nuernburg Military Tribunals (Washington, DC: United States Government Printing Office, 1950), 5:622. Andrew Herscher, Violence Taking Place: The Architecture of the Kosovo Conflict (Stanford, CA: Stanford University Press, 2010), 91. Kazimierz Moczarski, Conversations with an Executioner, ed. Mariana Fitzpatrick (Englewood Cliffs, NJ: Prentice-Hall, 1981), 164. While worthy of reflection, Moczarski’s quotations from Stroop should not be read uncritically. At the very least, we must bear in mind that Moczarski was himself under extreme physical and mental duress during the period of his contact with Stroop and did not record his recollections of their conversations until several years after they had taken place. For a facsimile edition of the report, translated and annotated, see The Stroop Report: The Jewish Quarter of Warsaw Is No More!, trans. and ed. Sybil Milton (New York: Pantheon Books, 1979). Pierre Nora, “Between Memory and History: Les Lieux de Mémoire,” Representations 26 (1989): 7–24, 22. Maria Janion, “Zmierzch paradygmatu” (“Twilight of the Paradigm”), in Do Europy tak, ale razem z naszymi umarłymi (Warsaw: Wydawnictwo Sic!, 2000), 19–34. Just as significant as Janion’s argument is her retraction of it. Observing how Poles memorialized the Communist period after it had ended, Janion has since recognized that Romanticism remains alive and well. Cited in David Crowley, “Memory in Pieces: The Symbolism of the Ruin in Warsaw after 1944,” Journal of Modern European History 9, no. 3 (2011): 351–72, 361. Less frequently noted—and this we may read as an instance of historical erasure—is that the art historians who advised the reconstruction of the Royal Castle deliberately worked from records from before the modifications that had been directed by the Russian administration of the Congress Kingdom. In this way, the Royal Castle today effaces the painful history of the Russian occupation. One such case is a wing of the Reduta Bank Polski, which still stands vacant and unrestored. Elżbieta Janicka, “The Square of Polish Innocence: POLIN Museum of the History of Polish Jews in Warsaw and Its Symbolic Topography,” East European Jewish Affairs 45, no. 2–3 (2015): 200–14, 200. Marc Augé, Non-Places: An Introduction to an Anthropology of Supermodernity, trans. John Howe, 2nd ed. (London: Verso, 2009), viii. Laurens ten Kate provides an accurate, lyrical précis of Sloterdijk’s “spheres” as an intermediate space: “in the end, a sphere is nothing more than the interval between place and non-place, between safe life and a life at risk—or, to put it in a general, existential way: between life and death” (“Uneasy Places: Monotheism, Christianity, and the Dynamic of the Unlikely in Sloterdijk’s Work—Context and Debate,” in In Medias Res: Peter Sloterdijk’s Spherological Poetics of Being, ed. Willem Schinkel and Liesbeth Ioordegraf-Eelens [Amsterdam: Amsterdam University Press, 2011], 107). Augé, by contrast, suggests that it is through the proliferation of non-places that places are “promoted to the status of ‘places of memory’” (Non-Places, 63). Jan Karski, Story of a Secret State: My Report to the World (Washington, DC: Georgetown University Press, 2010), 311. Patrzyłam na usta...: Dziennik z warszawskiego getta, ed. Peter Weiser (Krakow: Wydawnictwo Homini, 2008), 55. Jan Jagielski, Niezatarte ślady getta warszawskiego/The Remnants of the Warsaw Ghetto, 2nd ed. (Warsaw: Mówią wieki, 2008), n.p. Though it shares the same title, this “second edition” features notably different content from its predecessor, produced together with Tomasz Lec. See Jan Jagielski and Tomasz Lec, Niezatarte ślady getta warszawskiego /The Remnants of the Warsaw Ghetto (Warsaw: Żydowski Instytut Historyczny, 1997). As elsewhere in the Ghetto, this effacement extends to the name of where these images were taken. Pereca Street in the contemporary photograph would have been Ceglana in the older one. Frank Ankersmit, Sublime Historical Experience (Stanford, CA: Stanford University Press, 2005), 351. Emmanuel Ringelblum, Kronika getta warszawskiego: wrzesień 1939–styczeń 1943, trans. Adam Rutkowski, ed. Artur Eisenbach (Warsaw: Czytelnik, 1983), 481. As Samuel D. Kassow puts it, while “thousands of pages survived in the tin boxes and milk cans (a significant part of the archive was most certainly lost), little more than random traces remain of the men and women who wrote the documents, gathered them, copied them, and hid them” (Who Will Write Our History? : Emmanuel Ringelblum, the Warsaw Ghetto, and the Oyneg Shabes Archive [Bloomington: Indiana University Press, 2007], 146). Jacek Leociak, Text in the Face of Destruction: Accounts from the Warsaw Ghetto Reconsidered, trans. Emma Harris (Warsaw: Żydowski Instytut Historyczny, 2004), 91–92. Avishai Margalit and Gabriel Motzkin, “The Uniqueness of the Holocaust,” Philosophy and Public Affairs 25, no. 1 (1996): 65–83, 66. See Leociak, Text in the Face of Destruction, 96–102. “Those who took advantage of these amusements, and who were not bothered by the fires blazing and the martyrdom of the Jews right there in the Ghetto, were really barely a handful. Nearby stood a silent crowd of onlookers, looking with horror at the work of extermination perpetrated by the Germans, condemning, if only in their hearts, their countrymen making merry, but a crowd that was helpless, unprotesting, too afraid to express their disapproval aloud” (Tomasz Szarota, Karuzela na Placu Krasińskich [Warsaw: Oficyna Wydawnicza RYTM, 2007], 150). Interview with Benjamin Meed, Record Group 50.030, Oral History, RG-50.030*0152, United States Holocaust Memorial Museum. Joanna Gromek-Illg, “Ludzkość, która zostaje,” Tygodnik Powszechny 18 (2005): 19. Czesław Miłosz, New and Collected Poems 1931–2001 (New York: Ecco, 2001), 33–34. Ryszard Matuszewski, “Nieruchoma karuzela na placu Krasińskich,” Rzeczpospolita, May 10–11, 2003, Plus Minus (supplement). Szarota, Karuzela na Placu Krasińskich, 157–63. Matuszewski’s remarks in Rzeczpospolita created sufficient backlash that he tempered his disagreement with how Miłosz represents the scene in his book on Miłosz, published the following year. See Ryszard Matuszewski, Moje spotkania z Miłoszem (Krakow: Wydawnictwo Literackie, 2004), 33–34. Interview with Janina Prot, Record Group 50.233, Oral History, RG-50.233*0104, United States Holocaust Memorial Museum. Adina Blady Szwajger, I Remember Nothing More: The Warsaw Children’s Hospital and the Jewish Resistance, trans. Tasja Darowska and Danusia Stok (New York: Pantheon Books, 1990), 87. The anthology has been photographically reproduced in Tryptyk polsko-żydowski, ed. Władysław Bartoszewski (Warsaw: Rada Ochrony Pamięci Walk i Męczeństwa, 2003), 115–40. Marek Bieńczyk, Tworki, trans. Benjamin Paloff (Evanston, IL: Northwestern University Press, 2008): 67. A Film Unfinished, directed by Yael Hersonski (New York: Oscilloscope Laboratories, 2010), DVD. See Dirk Rupnow, “‘Ich müßt sein, auch wenn ihr nicht mehr seid’: The Jewish Central Museum in Prague and Historical Memory in the Third Reich,” Holocaust and Genocide Studies 16, no. 1 (2002): 23–53. Susan Sontag, Regarding the Pain of Others (New York: Picador, 2003), 119. See Richard Raskin, A Child at Gunpoint: A Case Study in the Life of a Photo (Aarhus, Denmark: Aarhus University Press, 2004), 20–21. Frédéric Rousseau, L’Enfant juif de Varsovie: Histoire d’une photographie (Paris: Editions de Seuil, 2009), 160–61. See Raskin, A Child at Gunpoint, 11; and Rousseau, L’Enfant juif de Varsovie, 163–64. Raskin notes that the addition of the Star of David is in turn a response to a memorial poem by Peter Fischl that describes the boy as wearing it, though he is not. See Danna Nolan Fewell and Gary A. Phillips, Icon of Loss: The Haunting Child of Samuel Bak (Boston: Pucker Art Publications, 2009). The program is described in detail in Rousseau, L’Enfant juif de Varsovie, 163–69. Lawrence Weschler, Uncanny Valley: Adventures in the Narrative (Berkeley, CA: Counterpoint, 2011), 120. André Malraux, The Voices of Silence, trans. Stuart Gilbert (Princeton, NJ: Princeton University Press, 1978). Benjamin Paloff is the author of Lost in the Shadow of the Word: Space, Time, and Freedom in Interwar Eastern Europe and of the poetry collections And His Orchestra and The Politics. He has also translated several books and shorter works from Polish, Czech, and Russian. He is an Associate Professor of Slavic Languages and Literatures and of Comparative Literature at the University of Michigan.